Getting a healthy and beautiful smile isn’t something that can just be done overnight – it’s a long process that starts from day one. 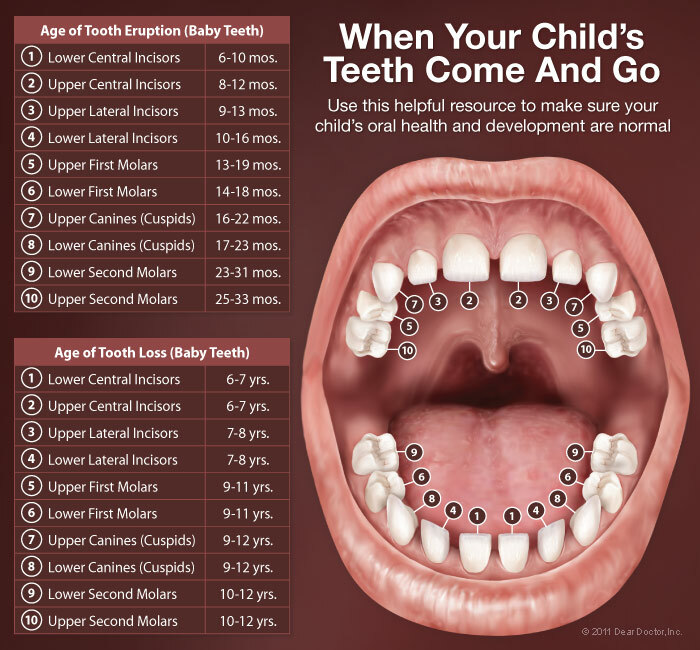 At Boerne Orthodontics & Pediatric Dentistry, we’re glad to provide that help from early on. When you come to visit your pediatric dentist in Fair Oaks and Boerne, we’re able to provide the expert pediatric dental treatments needed to make sure that your child is on the path to a lifetime of healthy smiles. We’d like to take the time to explain a little more about these treatments and also why they’re so important. Primary teeth will help your child chew properly and maintain great nutrition. They’ll also help him or her speak clearly. 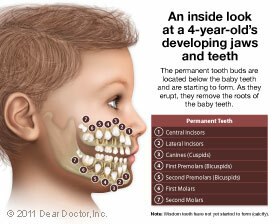 Primary teeth serve as the guides for the eruption of permanent teeth and will hold these proper spots open for them. By taking care of the primary teeth, your child will build and develop healthy dental habits for a lifetime. 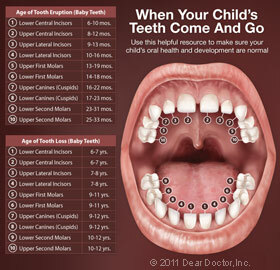 Your child will have 20 primary teeth that should appear sometime between the first six and nine months of age. The first ones that typically erupt are the two lower front teeth and then the two upper front teeth. After those, the first molars will come in and that will be followed by the canines. Your baby may experience some teething discomfort during this process so please let us know if it happens so that we can give you advice on how to treat it best. Because your child’s primary teeth are so important, you’ll need to make sure to clean them regularly. To clean your infant’s gums and newly erupted teeth, you should gently wipe them with either a damp washcloth or a water-soaked gauze pad after each feeding. When your child reaches the age of two, you should begin to help establish a daily brushing routine for your child. We recommend having your child use a small, soft-bristled toothbrush and a thin smear of fluoridated toothpaste to clean his or her teeth. It’s likely that you’ll likely need to assist your child with this task until about the age of six. The American Academy of Pediatric Dentistry recommends that your child’s first dental visit should be at about the age of one. This visit will allow us to help your child’s dental health in a number of different ways. We’ll be able to check for cavities, monitor for any developmental problems, and also teach you about proper oral hygiene techniques. Most importantly, we want to help ensure that your child has a positive experience when visiting your Boerne family dentist so that he or she will become more accepting of all the advantages that pediatric dentistry can offer. Topical Fluoride – Fluoride is highly beneficial to a child’s teeth because it will incorporate into the enamel of teeth, making them harder and more resistant to decay. While fluoride does exist in drinking water and toothpaste, it’s only available in small amounts. At our office, we can apply a higher concentration on your child’s teeth so that we can give him or her an optimal level of dental protection. Dental Sealants – Dental sealants are essentially plastic coatings that are placed on the chewing surfaces of a patient’s back teeth. Normally, a patient’s chewing surfaces of these back teeth will contain small crevices that are perfect environments for decay-causing bacteria to get trapped in. Sealants are used to smooth out these grooves and keep food from getting stuck there. Sealants are easy to apply and can provide protection to a child’s teeth for several years to come. Root Canal Treatment – Root canal treatment is helpful for saving teeth that are either badly injured or severely decayed. While root canals are most commonly thought of as a procedure for permanent teeth, they can be used on primary teeth as well. Saving these primary teeth can potentially end up preventing your child from requiring orthodontic treatment in the future. Bonding – Bonding materials are used to repair smaller chips and fractures to a patient’s front teeth. These lifelike resins that are made of plastic and glass are able to be used on both primary and permanent teeth. 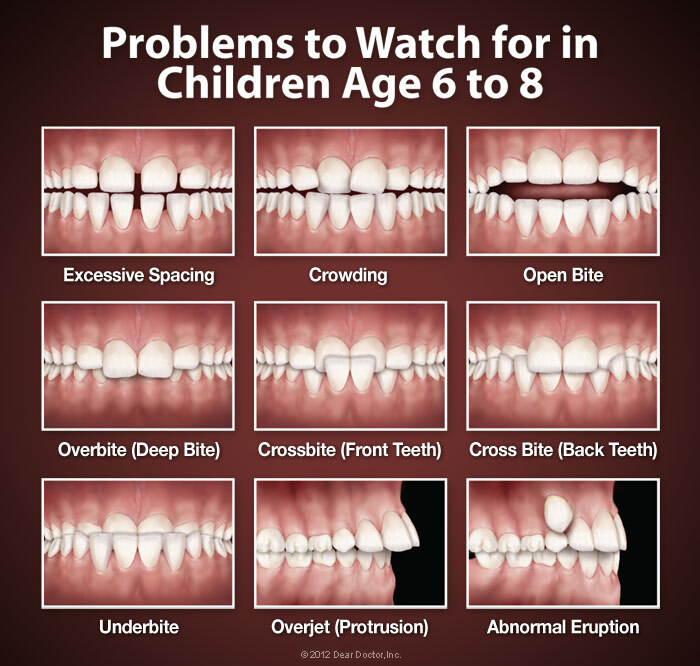 When your child reaches the age of seven, most orthodontic problems will be evident, which is why this is the best time to first see an orthodontist. Interceptive orthodontic treatment is useful around this time because an orthodontist will be able to help direct proper tooth positioning and jaw growth so that later orthodontic treatment can be simplified or even eliminated. Contact Your Fair Oaks and Boerne Pediatric Dentist Today! If you’re looking for Boerne and Fair Oaks pediatric dentistry and orthodontics, you’ve come to the right place! Feel free to give us a call at (830) 455-4063. If you have any questions for us, we encourage you to contact us online or by phone and let us know. We at Boerne Orthodontics & Pediatric Dentistry hope to hear from you soon!